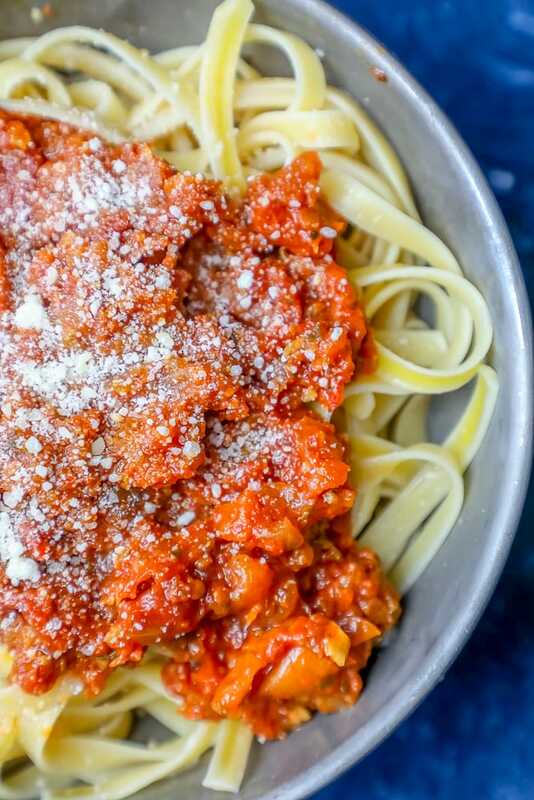 The Best Easy Roasted Red Pepper Marinara Sauce Recipe – delicious roasted red pepper marinara sauce that is perfect for spaghetti, linguine, and with all kinds of delicious pastas! 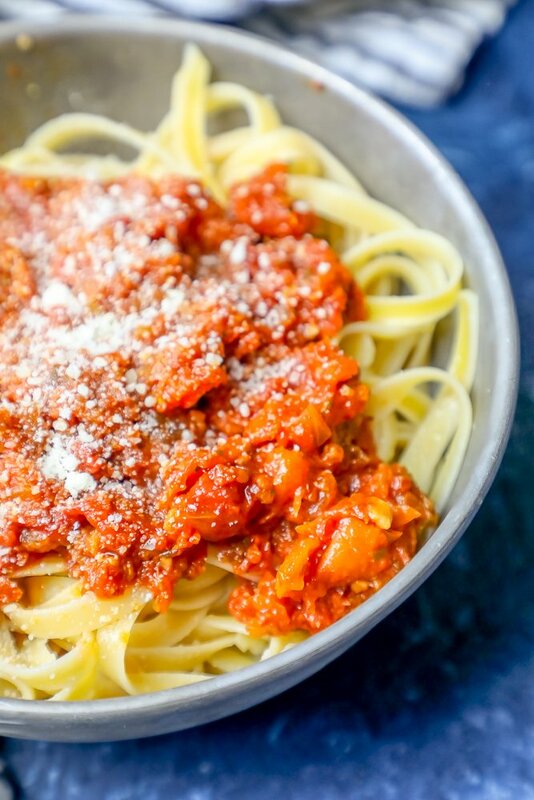 This roasted red pepper marinara recipe is a delicious, easy, and stunningly delicious vegan pasta sauce that is perfect for a comforting, hearty dinner the whole family will love. 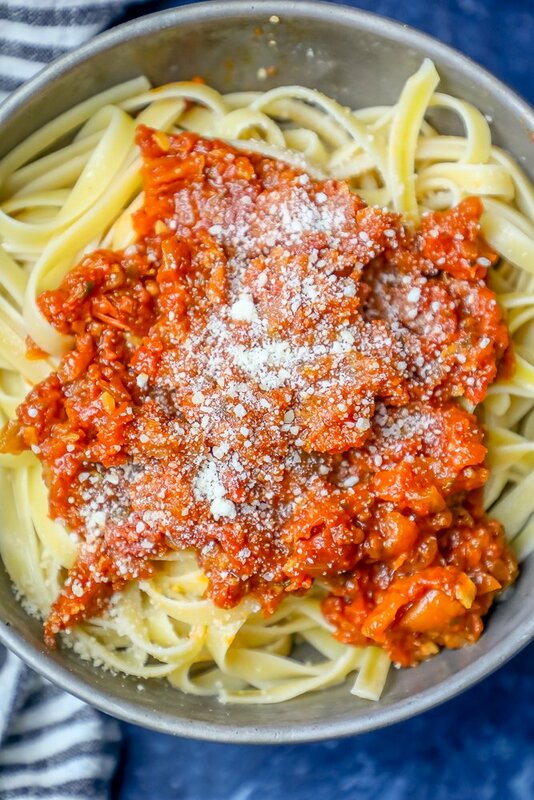 While I’m serving this red pepper marinara simply over linguine, it is absolutely delicious with chicken, beef, pork, seafood, and vegetables. 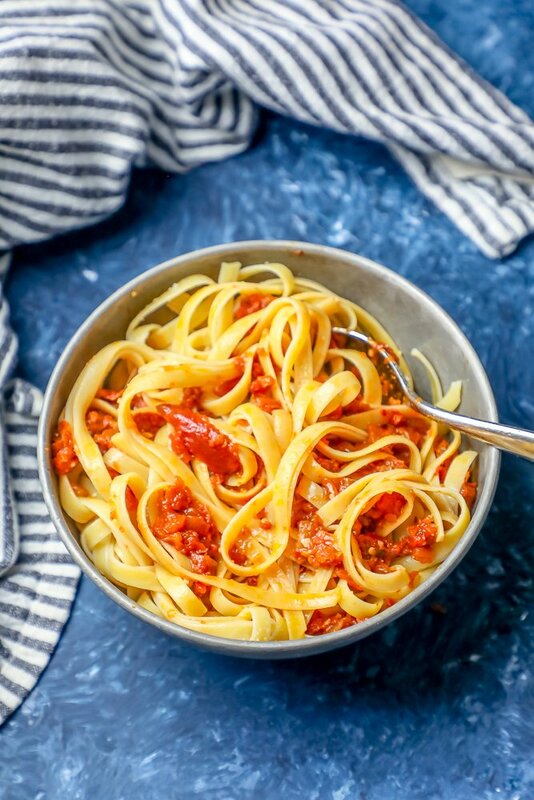 It is a truly versatile red pepper pasta sauce recipe that you can add your favorite ingredients into for a knockout dinner. Just take me to the best easy roasted red pepper marinara sauce already! 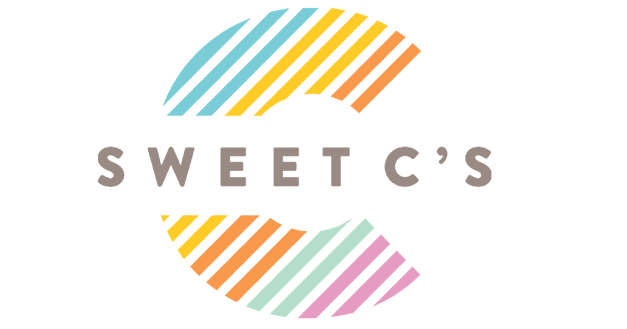 I get a lot of questions so I try to add lots of helpful information into my posts, so you can get the best results every time. 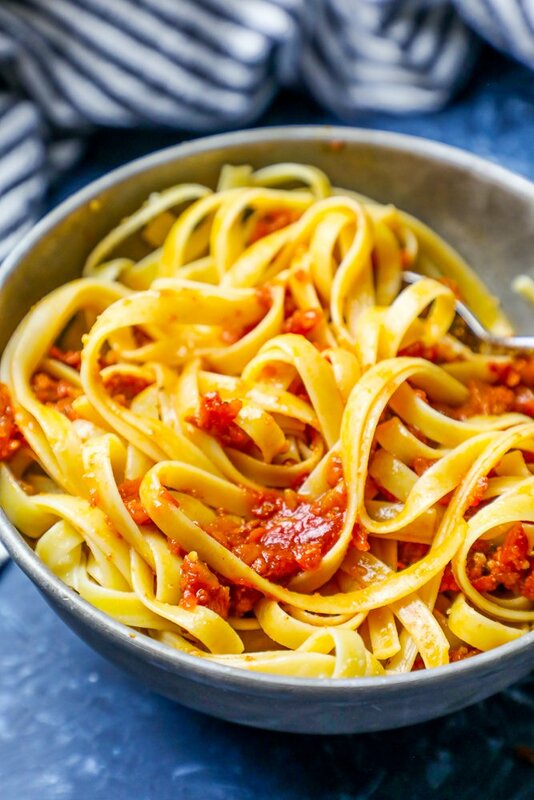 Cook Linguine to al dente. When boiling pasta, save 1/2 cup of the water the pasta cooks in, and add it to the sauce before serving. 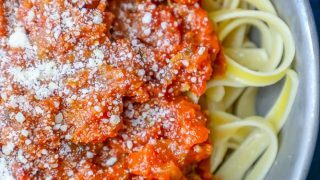 This tip sounds really weird – but adding pasta water to sauce helps the sauce emulsify, making the sauce stick to the pasta better and bringing all that delicious red pepper sauce flavor to perfection in every bite. Swap ingredients for what you prefer. This recipe has a ton of roasted red pepper flavor – but is also meant to work well with lots of other flavors and ingredients. Replace things you don’t like with something you do – mix in a little of something else you have on hand, feel free to add and make this recipe your own! This roasted red pepper marinara sauce recipe comes together perfectly – and is great with all sorts of meats, vegetables, and seafood! Serve over zucchini noodles with diced chicken breasts and mushrooms. Spoon roasted red pepper sauce over rice, quinoa, or into risotto! If you love the best easy roasted red pepper marinara sauce recipe as much as I do, please rate the recipe five stars and help me share on facebook and pinterest! The Best Easy Roasted Red Pepper Marinara Sauce Recipe - delicious roasted red pepper marinara sauce that is perfect for spaghetti, linguine, and with all kinds of delicious pastas! In a large bowl, crush the whole tomatoes with your fingers to form a course puree. Stir in the tomato paste, salt, pepper flakes, sugar, basil, and parsley, and set aside. In a large saucepan, heat the olive oil over medium heat. Add the onions and cook for 5 minutes, stirring often, until the onions begin to soften. Add the garlic and cook, stirring often, for 2 minutes (do not brown the garlic). Add the tomato mixture, and simmer over medium-low heat for 30 minutes, stirring occasionally. When sauce is almost complete, and pasta is boiling, remove 1/2 cup of starchy pasta cooking water and add it to sauce, bring to a gentle boil, and let sauce emulsify and thicken for about 5 minutes. Serve over pasta and enjoy.